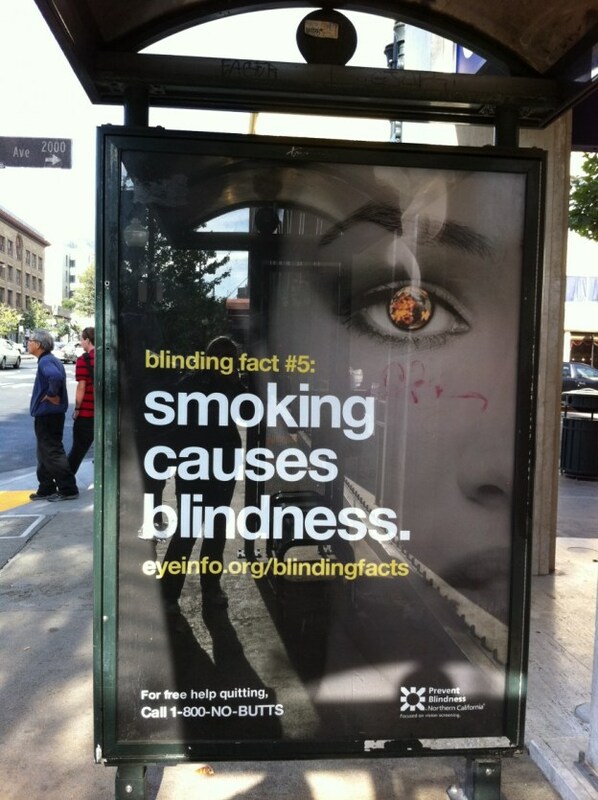 Disability as Scare Tactic for a Good Cause? I struggled with how to reconcile agreeing with the film’s agenda yet questioning how disability was being used so manipulatively. Of course people should not be texting while driving. And of course this was a tragedy for the newly disabled people and their families, one that all of them must face every day. Above all, there’s no way to erase or even minimize the pain, loss, and complete physical, emotional, and cognitive devastation that came to these unsuspecting people and those around them. But am I out on some radical limb to condemn this video and many other campaigns (such as those against smoking -see picture- or drunk driving) for equating disability and death? Herzog’s careful crafting of these stories and what they collectively say in From One Second to the Next tells us that there is little difference. No question: living with disabilities can be tough, not just because of physical, cognitive, emotional tolls they exert, but because of all that surrounds the general public’s misunderstanding of this state of being, from inhumane bureaucracies to towering medical bills to prejudice and stigma. He has us wallow in that excruciating place where people rightly grieve for the loss of an old life before it has been replaced by something new. He pulls at our heartstrings, gets us in that soft spot where it is impossible to imagine that other views of disability and disabled people exist, thanks in large part to nearly four decades of major political and cultural changes brought by a disability rights movement. In the name of a just cause, Herzog thrusts viewers back to nineteenth-century tear-filled moments with Tiny Tim in Dickens’s A Christmas Carol or scores of other popular dramas where being struck with a disability equals a living death. Surely more complex images ended up on Herzog’s cutting room floor. You can almost feel them lying in wait behind the families’ stories of loss and longing where we catch glimpses of two people with disabilities who show twinkles of promise as they converse, find joy, and suggest personalities that offer hints that tough as it is, life can and will go on. One only need imagine what it would be like for Xzavier and Debbie if, beyond their loving families struggling with their own bewilderment, they were exposed to other people with similar disabilities who have figured out things like how to play highly competitive wheelchair sports, how to use a white cane for mobility, how to file the right forms for social security and medical benefits, how to apply to college, how to thrive at work, what its like to fall in love and raise kids. And one might imagine with equal longing that these families had somewhere to turn for quality role models of inner strength and resourcefulness that disability has brought forth in our communities. And to take my dreaming a step further, what might it be like for Xzavier and Debbie to share not just a screen together but to someday meet in the same room? I imagine them swapping stories of muddy-footed film crews that descended upon them and their families, disrupting the house with chords and lights and moving furniture, setting up the scenes so that the normally cheery living room appeared dark and empty. They might tease each other about whose segment got to have the most maudlin music. What did they make of Herzog’s questions to their family members, the repeat takes, going over the story again and again? Did he capture their words and spirit, or had they actually said more as the cameras rolled? Admittedly, the complex portrait I seek blunts Herzog’s point, rendering it far less effective. So is there actually a constructive way of incorporating disability into a film such as this? Can disabled people ever be positive weapons in a cause that’s not about disability? I imagine a perceptive Xzavier and Debbie in the future, each of them working in their own way to help society overcome this poverty of representations of people like them. Maybe running a PR or law firm, maybe talking with family and friends, maybe just being themselves and having lives on their own terms. And maybe they’d be the ones to come up with that super-effective, not-yet-dreamed up way for convincing someone not to smoke, not to drink or text while driving. At the very least, they might settle on death, rather than disability, being the dreaded worst-case scenario.